One of the easiest expenses to reduce is the electric bill. Windows 7 is designed to more aggressively manage power than previous versions of the operating system. This is great news for organizations interested in reducing their power consumption. One of the best places to start is to create a power management report. Although it isn't accessible through the graphical user interface, Windows 7 can produce a detailed report on where power is being wasted. The report can be used to determine what adjustments need to be made to a power management scheme and settings. Upon issuing this command, Windows will monitor the computer's power consumption for the next 60 seconds. It will then provide a summary of how many issues were detected, as shown in Figure 1. 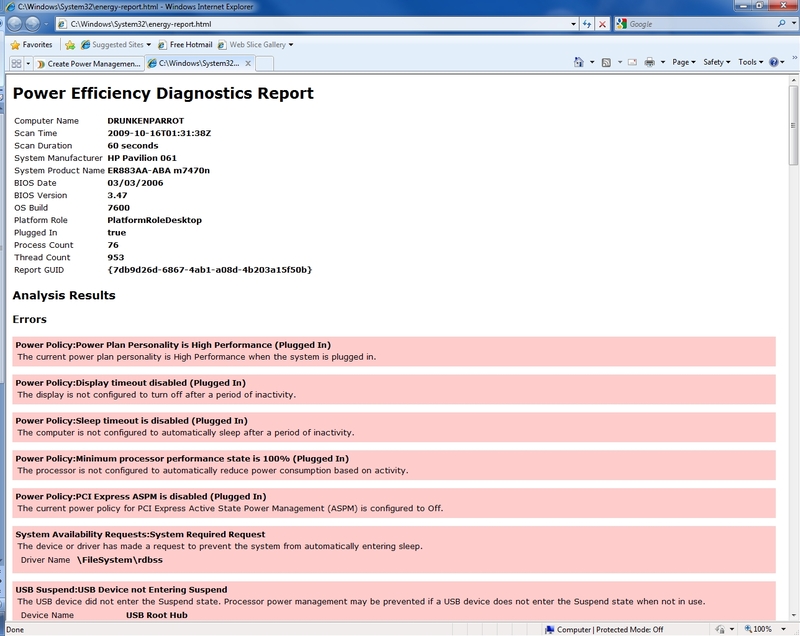 When I generated a power management report for my system, it found nine errors and 14 warning messages. Although this looks really bad, the errors reported are not errors in the traditional sense. In other words, an error does not mean that some aspect of the system is broken, but rather that power management has been disabled in certain areas of the system. The power management report specifies the portions of the power management configuration that triggered the errors and warnings. 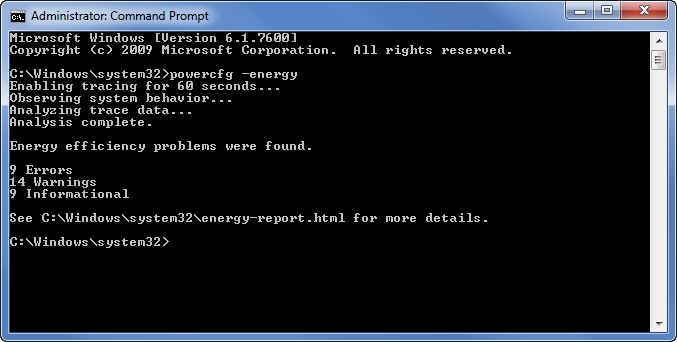 The report is an HTML file named "Energy-Report.html." It is located in the \Windows\System32 folder. Figure 2 shows what the report looks like. As shown in the figure above, Windows has detected several different areas where power management has been disabled. Use the Control Panel to make the necessary adjustments. The power management settings can be accessed by opening the Control Panel and clicking on the System and Security link, followed by the Power Options link. From there, a power plan can be selected, and you can change the individual settings within the plan. The Control Panel's power options haven't changed a lot since Vista. Some of the default power management settings are tuned a bit more aggressively than they were in Vista, but that's pretty much the only difference. Although a workstation's power management settings can fine-tuned through the Control Panel, doing so is impractical if it's for more than just a few PCs. A better solution is to control the power management settings at the group-policy level. The same settings can apply to every computer in the organization, thus ensuring optimal power management across the board. 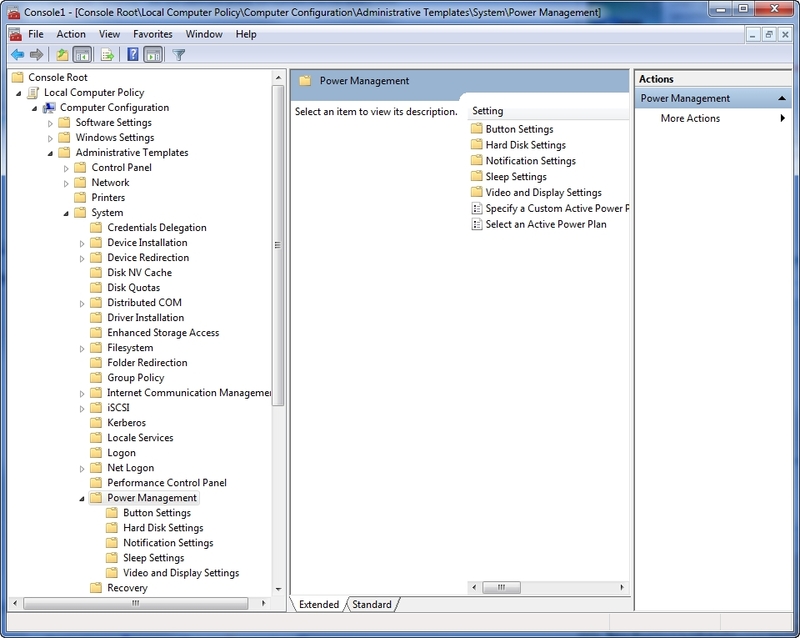 The power management settings can be accessed within the Group Policy Object Editor at "Computer Configuration | Administrative Templates | System | Power Management." Figure 3 shows that the group policies provide fine-grained control over how workstations use power. The best part is that the vast majority of these group-policy settings are also compatible with Windows Vista. Since many of the available group-policy settings existed in Vista, you may be wondering what is new. Probably the most significant new setting is Reserve Battery Notification Level. This setting (which is located in the "\Power Management\Notification Settings" container) allows a percentage of a laptop's overall battery capacity to be treated as reserve power. Another new setting is Allow Applications to Prevent Automatic Sleep (located in the "\Power Management\Sleep Settings" container). This setting allows an application to prevent a computer from going into sleep mode if the user is idle, but the application is working on something. Another setting in the same location allows a computer to go to sleep even if network files are open (Allow Automatic Sleep With Open Network Files). One last interesting area is the "\Power Management\Video and Display Settings" container. The Specify the Display Dim Brightness setting in this area allows control over the brightness level when Windows dims the screen. Similarly, Reduce Display Brightness allows control over how long a workstation must be inactive before the display's brightness is reduced. Although Windows Vista provided a high degree of control over workstation power usage, Windows 7 takes power management to the next level. If used properly, the power management report and the various group-policy settings should help your organization obtain substantial cost savings. Brien M. Posey, MCSE, is a Microsoft Most Valuable Professional for his work with Exchange Server and has previously received Microsoft's MVP award for Windows Server and Internet Information Server (IIS). He has served as CIO for a nationwide chain of hospitals and was once responsible for the Department of Information Management at Fort Knox. As a freelance technical writer, Posey has written for Microsoft, TechTarget, CNET, ZDNet, MSD2D, Relevant Technologies and other technology companies. You can visit his personal website at www.brienposey.com.